Popularly known as Haji Mastan, Bawa or Sultan Mirza was born on March 1, 1926 in Panaikulam village near Cuddalore, Tamil Nadu. He was an underworld don and smuggler based in Mumbai in the 1970s and 1980s. Mastan's father Haider Mirza, was a hard-working but poor farmer and migrated to Mumbai with Mastan in 1934 after failing to make ends meet in his village. They ran a small cycle-repair shop near Crawford Market that barely fed the family. But Mastan soon realized that even after all the hard work, he could only make a meager Rs 5 a day. As he would walk home to his basti he would stare at the cars of Mumbai’s rich and famous, their Malabar Hill bungalows, and resolved to be rich and famous himself one day. He would even see the grand theatres, such as Alfred and Novelty, on South Mumbai’s Grant Road. The year 1956 was a major turning point in Mastan's life when he came in contact with Sukur Narayan Bakhia, the two became partners in smuggling and divided territories among themselves. Mastan handled the Mumbai port and Bakhia handled the Daman port. The smuggled items would come to Daman port from the Persian Gulf and to Mumbai from Aden. He also took care of Bakhia’s consignments. Haji Mastan's rise was phenomenal but he was imprisoned during the Indian Emergency (1975 - 77). Surprisingly when he was released after 18 months from jail he emerged as a hero and was a reformed man. He learned Hindi in prison, and began doing social work in his community. Mastan Mirza began to introduce himself as Haji Mastan. Using the prefix of "Haji" refers to those devout Muslims who have been to Hajj in Mecca. Haji Mastan became a Muslim leader in 1984. In 1985 he set up Dalit Muslim Surakhsha Maha Sangh which had Doulatram Kawle as a co-operator. Aslam Kiratpuri, a well known journalist, gave him ideas on how to speak in public meetings after which he became a good speaker. Expanding his clout in the film industry by giving money to directors and studios for film production, Haji Mastan became the first celebrity gangster of the city. He was a successful distributor and excelled in the cinema business. Mastan began to produce films himself as his influence in Bollywood grew and planned his own foray into films with a project titled Mere Garib Nawaz, followed by other movies. Dharmendra, Feroz Khan, Sanjeev Kumar and Raj Kapoor. While the movie Deewar was in the pipeline,Salim Khan and Amitabh Bachchan often visited him. He was apprehended and jailed by agencies many time around as he was a notorious smuggler. He also had many friends in the world of politics. Although he possessed a huge mansion in a posh locality off Peddar Road, opposite Sophia College, he virtually lived his life in a small room built on the terrace of his bungalow. Haji Mastan was a man of style once out of his home and used to travel in a chauffeur driven white Mercedes-Benz which was a status symbol in those days. He always wore a pure white designer wear sporting a pack of imported cigarettes in hand. His room used to be full of Tamil newspapers, specially flown in from Chennai as that was the only language that Mastan knew to read. He made millions through smuggling gold, silver and electronic goods. He also had close links with a well known Dalit leader with criminal records, C. Pasupathy Pandiyan from Thoothukudi for his underworld sea contacts in southern Tamil Nadu. Haji Mastan helped many leaders escape to Tamil Nadu through C. Pasupathy Pandiyan during the Indian Emergency (1975–77). Haji Mastan never indulged in smuggling again after all the cases against him were disposed off. He floated his political party and devoted time to holding periodic meetings with the poor and the needy in the minority community-dominated localities of south Mumbai and held public rallies at Mastan Talao near Nagpada police station. He also joined hands with anti-drug abuse activists like Dr Yusuf Merchant and implored the youth to stay away from killer drugs. He courted a few Bollywood starlets and even tied the knot with a starlet called Sona. He financed a few films for her. He gifted her a bungalow situated near actor Dev Anand's house at Juhu. When don Vardabhai (Varadarajan Mudaliar) died in Madras, Mastan chartered an Indian Airlines plane and brought his friend's body to Mumbai for last rites as per Vardabhai's wishes. 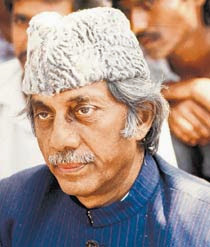 Haji Mastan alias Mastan Mirza died in 1994 after a cardiac arrest. In 2010 movie named Once Upon a Time in Mumbaai was released which was inspired by his life. The character of Sultan Mirza was played by Ajay Devgn. In the movie Deewar, Amitabh Bachchan's role was inspired by him.